Surprise! 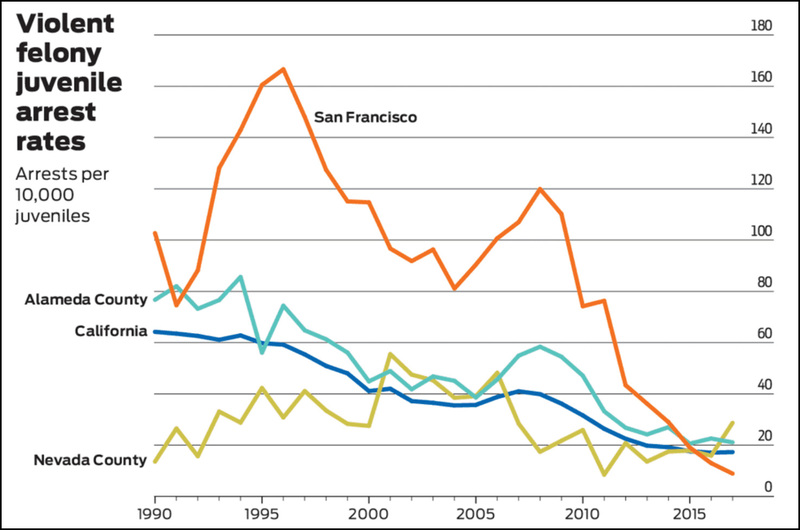 Juvenile Crime Has Plummeted in California. Over the past decade, the state’s numerous expanded juvenile halls have become near-empty monuments to a costly miscalculation — a mistake compounded each year as the number of young offenders plummeted. Some California counties are spending $1,400 a day to incarcerate each juvenile, or $500,000 annually, up from $400 a day or $150,000 annually just eight years ago….Unlike the surge of violence a generation ago, the plunge in juvenile crime has received relatively little attention and has spurred few demands for action. My, that is a mystery, isn’t it? ….Systemically, there is no clear explanation for why the crime rate dropped, and continued to decline through the 2008 recession and to the present day. Though there’s no consensus, many are eager to offer theories and take credit. Possible reasons include a decline of lead poisoning in children, which reduced the toxic effects on young brains, and pivotal shifts in the street drug trade, including diminishing demand for crack cocaine and strict laws that sent dealers who might recruit young people away for decades. Give it up, folks. It’s lead. And that’s a very good thing, since it means the drop in juvenile crime is permanent. It’s time to scuttle all that extra space in juvenile hall.